What I've Learned | What Smells So Good? Cooking for kids - any kids - is always a touch and go experience. Sometimes, they blow you out of the water by scarfing down the most unlikely things. I remember the first time I ate dinner at my friend Lyndsey's house - I had never had asparagus before in my life (it was a "grownup" food that people assumed my 9-year-old tastebuds wouldn't take to) and so "didn't like it", but lo and behold what appeared before me at the table was a plate filled with two of the three things I believed that I detested: steamed rice (I know, weird)﻿ and - gasp! - asparagus. But it wasn't just asparagus, it had "stuff" on it - which I later discovered was the delectable goody known as Hollandaise. Needless to say, after that first bite, I was hooked. I cleaned my plate that night, and discovered by the end of it that it didn't even need the sauce... the rice, on the other hand got a bit more than a drizzle! So you can imagine my mom's look of shock when I came home proudly declaring my newfound love for the vegetable... as a kid where basically broccoli with a whack of butter or cheese sauce and Caesar salad were the only greens on my plate, an unadorned veggie was as alien to her eyes as it was to my tastebuds. But it was delicious - and obviously as the years went on I discovered a love for almost every root, stalk, leaf and fruit out there. But then you have those kids that, no matter what you try to give them, it's a no-go. My sister? It's like pulling teeth to get anything healthyish into her. Those boxes of Mac and Cheese that have pasta with cauliflower in them but "tastes like white pasta"? Forget it. Ditto on the whole wheat stuff - the glare she'd give you would send you running for the hills. The "smart pasta" and "white whole wheat" Wonder bread get similarly snubbed. She will eat peas, baby carrots, the occasional apple and tiny salad, but it's been my experience that it only ever happens when they have been prepared for her. You'd think that it would make just making everything from scratch the only way to have anything she likes on the menu... but again, not so much. Apart from occasional waffles, scrambled eggs, broiled plain chicken and maybe a morsel of steak, nothing "homemade" masses muster. Boxes, cans and the frozen aisle are the way to her heart. She even passed up my mom's homemade red velvet cake for her last birthday in favour of a boxed mix and can of frosting! And if a cake is being made - you can bet she won't let me do it. The ones I do from the mixes apparently "taste weird", regardless of how closely I follow the directions. There are two baked goods I am allowed to make for her (according to her, anyway! 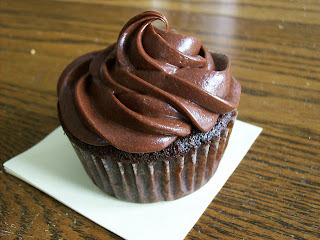 ): my chocolate chip cookies (either version) and these cupcakes. All three of them are "from scratch", and all three of them have a secret ingredient in them - whole-grain flour. But I'm not going to say anything - and I'm trusting you won't either! While I knew using "plain" whole wheat flour wouldn't fly in these Devil's Food cuppies, I did find one way of sneaking a bit of nutrition in - using "white whole wheat" flour (Robin Hood's NutriBlend to be specific) in place of standard all-purpose. Since we only have either whole or 1% milk in the house, that was a no brainer - and even though there is butter, sugar and an egg, there's also a good dose of cocoa powder... and far less fat than your storebought confection. That doesn't take into account the frosting, but since she was going to slather it on anyways, I figured I'd control the quantity a touch (and make it pretty along the way). Preheat the oven to 350F and grease or line 12 muffin cups. In a small dish or cup, whisk together milk and vinegar. Set aside for 10 minutes. In a medium bowl, whisk together flour, cocoa and baking soda. Set aside. In a large bowl, beat together sugar and butter until fluffy. Add half the dry ingredients, blending well, then pour in the milk mixture. Beat in the milk until smooth and add the remaining flour. Bake for 23 minutes, until they test done with a skewer.